It's this moment in the third (and possibly final) installment in the rebooted Tomb Raider trilogy that we realize Lara Croft has come full circle. Whatever reservations may be had about this vastly re-imagined Lara Croft, Shadow of the Tomb Raider commits wholeheartedly to the notion that this is the person she’s meant to become, even as it struggles to explain or understand the darkness she fights against. Though Shadow of the Tomb Raider was developed by Eidos Montreal, the studio behind the rebooted Deus Ex series, it's a largely unchanged experience, gameplay-wise, from what Crystal Dynamics previously established. Lara still controls as before, shuffling from cover to cover, popping headshots with her bow, and leaping from one perilous handhold to another. However, several attempts to expand these mechanics (though the effort is appreciated) feel at times ill-considered or not satisfying enough to warrant their existence. Lara is now capable of caking herself in mud, hiding in bushes, lacing her arrows with fear toxins, and stringing enemies up from tree branches. She’s a true hunter, even setting up Predator-style ambushes; Lara can also retreat back into stealth when she’s discovered, provided she can break their line-of-sight long enough to confuse her enemies again. Shadow of the Tomb Raider wants you to lean into these new skills, as evidenced by constant tool tips reminding you of their uses. Unfortunately, while these new mechanics grant Lara the confidence to tackle just about any group of foes – mostly the soldiers of the vaguely-defined paramilitary group known as Trinity – they don’t really do much to invigorate the formula established in the 2013 reboot and refined in Rise. Playing Shadow also requires you to accept spotty AI that’s grown increasingly ill-equipped to deal with your toolset. In previous games, we tolerated the enemy AI's reliance on cover and flank tactics to close the distance. But when you have dozens of ways of taking them out, enemies become little more than fodder for your sadistic amusement. 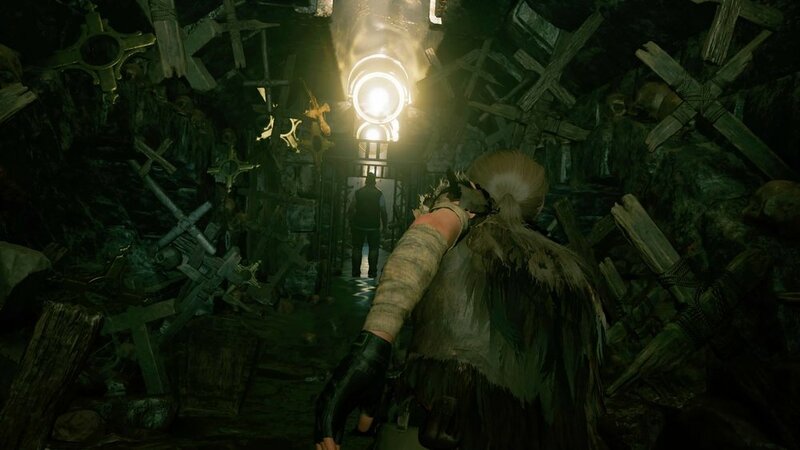 And that’s unnerving, for while this iteration of Lara Croft has always straddled the line between adventurer and mass murderer, Shadow of the Tomb Raider decidedly tips the balance into making her a true terror. And yet, despite the massively empowered Lara in Shadow of the Tomb Raider, many of the series’ lingering problems remain. Some new enemies focus on rushing into melee attacks, attempting to overwhelm you with their sheer numbers. But Lara’s clumsy melee attack and imprecise dodge shuffle serve to make these encounters more difficult than they should be. And while you’d think a pistol or shotgun would be your go-to keep-away tools, they’re difficult to use in close quarters. Another source of frustration is Shadow of the Tomb Raider’s failure to communicate what direction your damage is coming from – evading away from a source of damage instead of towards it is made difficult when it's a guessing game as to where your foe is. The result is that several encounters see Lara scurrying aimlessly and frantically in a bid to create enough space to use her bow or rifle. It’s a different matter when you’re at mid-range, where Lara is dodging suppressing fire, throwing smoke grenades from cover and maximizing her ability to score fatal headshots. It’s here Lara becomes the stone cold killer that Shadow of the Tomb Raider intends her to be, but it’s also an unfortunate indication that little has been done to correct the shortcomings of the previous games' combat mechanics. The beauty and splendor of the environments continue to be the undisputed highlight of the Tomb Raider series, and Shadow of the Tomb Raider excels particularly in this regard. While destroyed beauty defined the 2013 Tomb Raider’s Yamatai and frozen wonders abound in Rise, this game lunges for a diverse brilliance and lushness that makes it the best looking of the bunch; it's also supported by design work that makes for a more intricate exploration experience. There’s a dizzying complexity to the game’s verticality, with each area featuring several levels of elevation to explore. Jungles feel imposing and the endless ruins are challenging to navigate. Each newfound path and discovered area becomes a serious distraction, despite the variable mileage you might get from the game's numerous collectibles. The true standouts are the tombs, whose architectural nuances make for more rewarding experiences. Personally, tombs were a source of much concern for me. Every time I stumbled upon one, I was guaranteed to spend time scratching my head while puzzling out solutions instead of forging on with the campaign. If you’re wondering why this review is being published later rather than sooner, you can blame the tombs, which, like any good intellectual time sink, provide the satisfaction of making you feel smarter than you really are. Perhaps the most unfortunate disappointment in Shadow of the Tomb Raider is the game’s story. Critics have been quick to criticize its awkward attempt to wrestle with the cultural theft that underlies Western archaeology. But personally, it was the game’s tendency to render apocalyptic catastrophe as set piece-based spectacle that I found problematic. Lara narrowly escapes mudslides, floods and other disasters, and although the people of South America must endure real hardships, the game centers on the guilt Lara feels from being complicit in the apocalypse. This wouldn’t be so bad if Shadow of the Tomb Raider was able to wrap up its own story in a satisfying manner, but it doesn’t. The game’s villain, Pedro Dominguez, has some interesting motivations, but they feel peripheral to our limited understanding of what Trinity is. Collectibles try to fill these gaps in, but ultimately both Dominguez and Trinity are but ciphers for the game’s plot. And while Shadow promises Lara Croft's growth and transformation into a determined tomb raider, she remains the same conflicted albeit self-centered person she always has been. That doesn’t make her any less compelling, mind you, but it’s a far cry from the course towards cocksure adventurer that Square Enix, Crystal Dynamics and Eidos Montreal claims to have charted for her. Despite her bold, auspicious origins as vulnerable survivor and haunted truth seeker, Lara hasn’t really grown much. That speaks to the heart of Shadow of the Tomb Raider’s problems. While it sustains many of the best qualities of the franchise – its captivating and inspiring lead, its breathtaking wonders and heart stopping sequences – it doesn’t really move the needle for it, nor does it do anything to fulfill the promise the reboot laid out half a decade ago, and remains stuck in its shadow.